Brrr! 'Dead Of Winter' Sets In; Coldest Air In Nearly Two Years : The Two-Way In North Dakota it's felt like -51 degrees. Folks in Cleveland woke up today to wind chills of -10 degrees and lower. 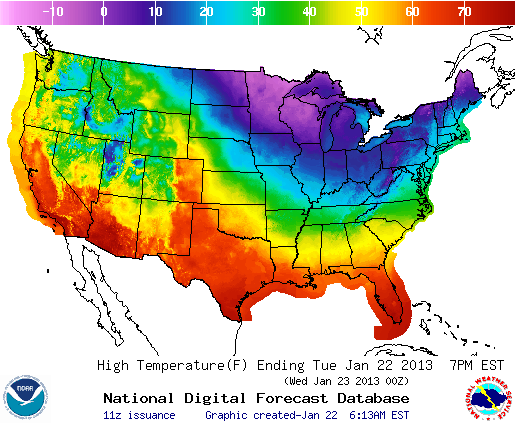 The frigid air stretches east into New England and south into the mid-Atlantic. Tell us, how cold is it for you? It felt like -51 degrees Fahrenheit in Langdon, N.D., on Monday and brutal wind chills like that are going to continue across northern states as winter really sets in. Even in the "warmer" places, it's not going to feel like it's much above zero for the next few days. And "lake effect" snows are expected to pile up around the Great Lakes. Weather Underground's Jeff Masters says this big freeze is bringing some of the coldest temperatures the nation has seen in nearly two years. And the low, low readings will continue through the week from the upper Plains to New England and down into the mid-Atlantic. The Weather Channel puts on its Mom hat to tell folks that "scarves, stocking caps, long underwear — all of it will come in handy for millions of you this week." National Weather Service meteorologist Jon Hitchcock tells The Buffalo News that "we're finally back to the dead of winter, and it looks like it's going to last for a while. This probably will be the coldest we've seen in a couple of years." At 6:15 a.m. ET today in Cleveland it was 11 degrees and with the wind it felt like -14, The Plain Dealer reports. Schools across Northeast Ohio (and in many other places in the grip of this cold snap) are closed today because of the weather. Feel free to answer that classic question — "How cold was it?" — in the comments thread. By the way, it's pretty cold in Europe this week too. Commenter "Fred Flintstone" offered an old classic — "It was so cold that I saw a lawyer with his hands in his own pockets!" — that's so far been "voted up" 45 times.